What determines how successful you’ll be with your SEO? Lots of things, and you can see a list of what's involved with SEO here. Not surprisingly, one of the big ones to consider is writing content for your website, because it's being read by two audiences your prospects and search engines. Not only does your website's content showcase the knowledge of your company, but Google's algorithms are scanning it to determine how it should rank in its searches. Writing content for your website. So writing content for your website is something that requires a lot of time and attention. 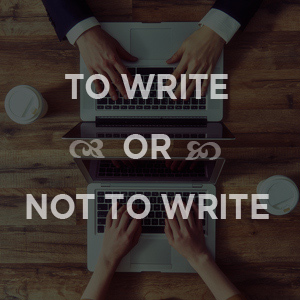 And often, in an effort to save money, clients ask if they can write the content of their websites themselves. The answer, of course, is yes. And if they want to go that route, we do what we can to educate them about what goes into writing content for their website. We research and provide the keywords they need to include throughout their copy, and give as much additional guidance to help ensure their copy is what we call "SEO-compatible." Following is some of the information we share with clients to help educate them about their copy and SEO. What determines how successful you'll be with your SEO? How much SEO your competitors are doing. If they’re not doing much, that gives you a huge advantage. We can tell how much SEO your competition is doing by looking at their websites. How serious you are with your blogging. This includes how frequently you post, and how diligent you are using the keywords we've researched and provided. The keyword competition. You’ll probably never be able to rank for a keyword like “customer experience” because it’s a broad term, has a lot of competition, others have been using it for a long time (so there’d be a lot of catch up) and large companies have been using it, so it’d be tough to compete with their resources. The market you’re in. The smaller your target market (ie: Columbus vs. Ohio vs. the entire U.S.) the easier it is to start ranking for your keywords. Adding keywords to your Page Titles and Meta Descriptions. To see what Page Titles and Meta Descriptions are and how they’re used by Google to rank your website, watch the first 40 seconds of this video. Naming the images in your website with keywords. When naming images, we use keywords in them, which helps the synapses of the internet start to associate those keywords with your website. Using keywords in the headlines, subheads and body copy. Also a way to help the internet’s synapses (ie: algorithms) start to associate those keywords with your website. Lifting copy from a presentation to place on a website. One of the things a client suggested they do for the copy of their website, was place the copy from their PowerPoint presentations in their new site. They could certainly do that, but it would be terrible for their SEO. Good on-page SEO consists of these items. Incorporating keywords into the text. Presentation copy usually doesn't include keywords. When their presentation was written, the keyword research hadn't even been done. Keyword density is something to be aware of when writing. Keyword density on each page shouldn’t be more than 5% of the total word count on that page. (Google's algorithms check these things!) And i's important to focus on keywords for that page’s specific content, focusing on a mix of 2 or 3 keywords per page. Incorporating keywords into the subheads. Search engines give more “weight” to headlines and subheads than body copy. With that in mind, it’s important to include keywords in your headlines and subheads. This also helps break up your copy, making it easier to read. Incorporating links on each page. Google’s algorithms like to follow links. Links to other internal pages, and outbound links to authoritative websites that help the credibility of your article. So be sure to include links within the content of each page. The more you post fresh content on your website, the more Google and other search engines re-index your website. And every item listed above needs to be incorporated into every blog, along with adding Page Titles and Meta Descriptions. This is called Content Marketing. In addition, adding images to your blog posts adds interest, just as it does with social media posts. And images are part of good SE, so you'd also need to subscribe to a good stock photo service for access to good images. If you want to get the most out of your website’s SEO, it is critical to do all the items outlined above, for every inside page, and every blog/article you write for your website. Maybe writing your own content isn't the best idea. You can certainly prepare the content for your own website, and we encourage it if you want to understand, and take your website's SEO seriously. No one knows more about your products and services than you do. You are the ultimate expert of your company, so you’re certainly the best person to write the content. writing takes way longer than you’d expect. If you’ve never had to track your time (like we do every day doing projects like this), you’ll severely underestimate how long writing takes. From our experience, the odds are against you for doing the writing, especially as it should be, and in a timely way. This is why you might want to consider having the web design firm, or a writer who is well-versed with writing for the web, take care of the content of your website. When getting an estimate from a writer who might be doing your website content, make sure they have the following steps listed in their proposal. They'll write the blog posts. They should tell you they'll subscribe to industry blogs (you can help direct them to the right sources) so they’ll be up on trends and issues in your industry. This helps them determine subjects to write about and address on your blogs. Hopefully, this gives you the background you'll need to make an informed decision about who should be writing the content for your website. It isn't a decision to be made without having this type of background information. From here, we hope you'll be able to make the best decision for your situation.